Aruba hopes to generate 100 percent of its energy from renewable sources by 2020. Photo by Christian Córdova, courtesy of Flickr. Best known for its resorts and white sand beaches, the Dutch Caribbean island of Aruba is also making a name for itself as a leader in renewable energy. The country has set an ambitious target of getting 100 percent of its power from renewable sources by 2020. Its leaders say by the end of next year the island will be halfway to that target. But to get the other half, Aruba will have to overcome a major obstacle: figuring out how to maintain a consistent flow of power from the country's wind turbines and solar panels. "When you have a very high percentage of renewables within the total capacity, there is one challenge, and that's the fluctuation on the grid. The wind is not constant, the sun comes and goes, so the stability on the grid is very important," Aruba Prime Minister Mike Eman told ClimateWire. 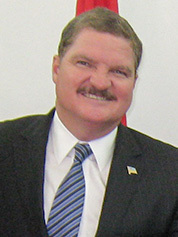 Aruba Prime Minister Mike Eman. Photo by NASA scientist Edward Cheung, courtesy of Wikipedia. The National Renewable Energy Laboratory (NREL) in Colorado has been working with Aruba to develop ways to overcome the problem. Because energy storage technology is expensive, finding ways to make energy demand more flexible can help bring down costs, said Adam Warren, group manager at NREL. The island is introducing a new cooling system that uses ice storage to keep air conditioning running smoothly if there is a sudden drop in wind power, the island's main source of renewable energy. NREL is also using computer modeling to help predict the least-costly ways to use energy storage technology throughout the grid. Aruba will also have to overcome another challenge that other ambitious renewable energy adopters don't face. Because it is an island, Aruba cannot depend on its neighbors for emergency backup transmission, should it be hit with a major sustained power outage from something like a hurricane. All the energy produced has to be on the island itself. "Aruba is gifted because they have the best wind resource I've ever seen. I think on that island they could go a long way on wind and solar," Warren said. Aruba is leading its neighbors in terms of renewable energy capacity. Energy experts said islands like Jamaica, the Dominican Republic, St. Lucia and Grenada have all made firm commitments to broaden renewable fuel use but have lower levels of adoption than Aruba so far. According to the Aruban government, the island is now getting 30 percent of its energy from renewable sources. Meanwhile, NREL's latest available figures suggest its capacity is closer to 15 percent of total power. That discrepancy may be partly because NREL is using older numbers that do not include the country's latest solar panel installations, and partly because of how it is defining capacity, said Warren. "At any one point, a third of their energy can come from renewable sources, but over the year, they are producing about 15 percent," he said. Altogether, Aruba has 30 megawatts of installed wind capacity at its Vader Piet wind farm, with another 26.4 MW expected to come online next year at a second wind farm. The solar park at the Queen Beatrix International Airport has 3.6 MW of installed capacity, and 3.8 MW of rooftop solar panels is already installed as part of its new 7-MW solar schools project. The country is also producing 2 MW from eco-gas, according to the Aruban government. More than 80 percent of Aruba's electricity is generated using imported heavy fuel oil, which experts say leaves it vulnerable to global oil price fluctuations. 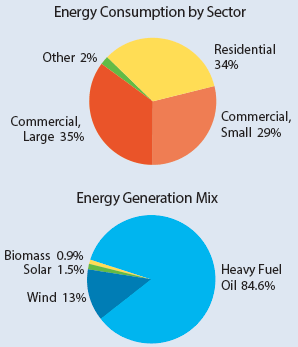 Graphic courtesy of the Energy Department. These renewable sources are meeting a growing portion of the island's peak energy demand. The rest of the power comes from imported heavy oil and diesel, both fuels that are not commonly used in the United States for electricity but are the main source of energy through almost all of the Caribbean islands. It is the high cost of these fossil fuels that has made adoption of wind and solar, which have seen significant price drops in the last few years, so attractive in the region, said Warren. Even if Aruba were to meet its renewable energy target, it's unlikely that fossil fuels would disappear from the island anytime soon. "Once one is approaching 100 percent, a variety of backup options, including natural gas and storage, will be critical," said World Bank Senior Energy Specialist Mark Lambrides, who has worked with Latin America and the Caribbean. "We are certainly impressed with [Aruba's] commitment to move to 100 percent renewables; even if they can't do that immediately, the commitment is impressive," he said. Having a diverse array of energy sources will also help islands like Aruba be more resilient overall to climate-change-driven environmental changes, Lambrides added. Aruba's prime minister is optimistic. While attending last week's U.S.-Caribbean-Central American Energy Summit in Washington, D.C., Eman and the Aruba delegation met with private business leaders to discuss new energy storage options. Eman said the delegation came away from the meeting encouraged by the possibility of implementing new, cheaper technologies on the island. Aruba first announced its intention to pursue a 100 percent renewable energy target at the United Nations Conference on Sustainable Development in Rio de Janeiro in 2012. Planning began a few years earlier in 2009, when the government began making partnerships with international organizations to begin the island's transition. 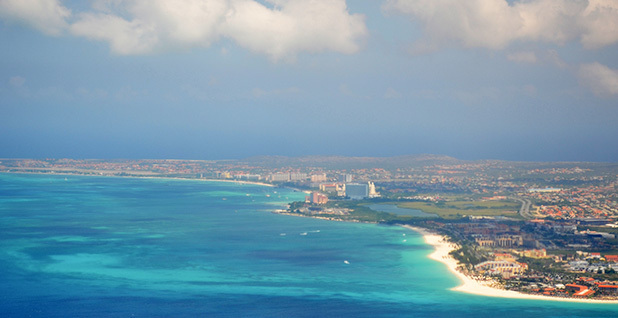 Over the past few years, Aruba has gained international recognition for its efforts to reduce its fossil fuel use. One key component to the strategy has been getting utilities on board with the transition to renewable fuels early in the process, something other countries have either neglected or have not been able to do successfully, the prime minister said. The driving force for the change was not simply about environmental benefits. The shift was part of a broader vision to create a more sustainable and equitable society for the island's residents that would produce "five-star" schools and "five-star" neighborhoods, as well as five-star hotels, said Eman. "We have been very fortunate in Aruba to have a very prosperous tourism industry. However, if we look at the development over 25 years, we do see that it's not automatic that tourism growth translates into well-being," he said. "It has been also very clear that if you look at the revenues, how much of our revenue would go abroad because of paying for fuel to produce our energy, while we have sun and wind in abundance. We said that within our sustainable vision, it fits very much also a vision of how we are going to handle the subject of energy." Four years later, the island is now focusing its renewable energy efforts at its schools. "So where the adults are maybe not as enthusiastic or connected to this vision, the kids will help also when this is part of their education. We are very excited that we are doing that as the next step for expanding our solar capacity in Aruba," the prime minister said.